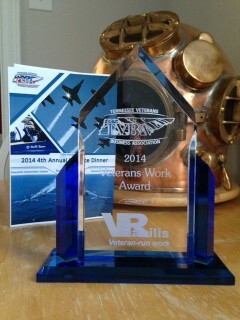 Home » VRHabilis News » VRH receives “Veterans Work Award” from TVBA for 2014! VRH receives “Veterans Work Award” from TVBA for 2014! VRHabilis was humbled and flattered to learn the company had been chosen to receive the “Veterans Work Award” at the 4th Annual Business and Education Showcase sponsored by the Tennessee Veterans Business Association (TVBA). This award recognized the efforts VRHabilis makes towards hiring veterans and in particular those who have been disabled as a result of their military service. Close to 95% of the field crews and all project management staff at VRHabilis are veterans and/or retired from the US military. Tennessee Veterans Business Association was formed four years, built on four cornerstones: Marketing, Government Advocacy, Education and Training and Veteran Employment Issues. The TVBA is a one of a kind business association and the only entity across the country that brings these four vital elements together on behalf of veteran owned businesses and the veteran job seeker. VRHabilis is a charter member of this fine, dynamic organization and is very grateful to the recognition received through this award.